The Dental Journal (Majalah Kedokteran Gigi) (e-ISSN:2442-9740; p-ISSN:1978-3728) is published by the Faculty of Dental Medicine, Universitas Airlangga. Its diciplinary focus is dental science and dental hygiene. 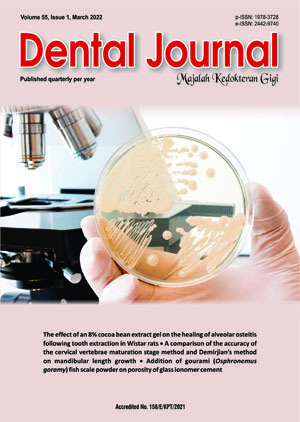 The Dental Journal (Majalah Kedokteran Gigi) is published in English on a quarterly basis with each 50-60 page edition containing between nine and eleven scientific articles on research, study literature and case studies. Contributors to the Dental Journal (Majalah Kedokteran Gigi) included: dental researchers, dental practitioners, lecturers, and students drawn from Indonesia and a wide range of other countries. The Dental Journal (Majalah Kedokteran Gigi) has been certificated as a Scientific Journal by The Indonesian Ministry of Research, Technology and Higher Education (RISTEKDIKTI) since April 26th, 2017. Update Accreditation Number: 32a/E/KPT/2017 valid until April 25th, 2022. The Dental Journal (Majalah Kedokteran Gigi) is a nationally-accredited, peer-reviewed, open access, scientific journal published in Indonesia. We invite paper submissions in three forms: research reports, case reports, and literature reviews. Submitted papers must contain original work (screening to detect plagiarism will be conducted) and previously unpublished. The confidentiality of submissions, which should be in English, is respected during the review process. All submissions will be peer-reviewed by subject expert. Once accepted for publication, all manuscripts will undergo editing, setting and reference validation. Kindly visit the call for papers page for online submission or email us at dental_journal@fkg.unair.ac.id for more information. Thank you for your attention, we look forward to receiving your manuscripts. Dental Journal (Majalah Kedokteran Gigi) (p-ISSN:1978-3728; e-ISSN:2442-9740) is licensed under a Creative Commons Attribution-ShareAlike 4.0 International License.